Start planning and stop worrying! A Gallup poll showed that 60% of those surveyed worried about their financial future. 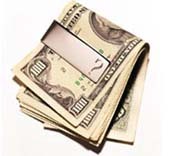 Put aside a set amount regularly in savings or other investments. The compounding of earnings can be substantial. The longer your investment period, the greater the beneficial effect of compounding. Click here to calculate how fast your savings can grow. Invest in what you know. The better informed you are, the better your investment decisions will be. If you don't want to learn about investments, consider hiring a money manager and paying him or her to do your investing for you. Diversify your investments. Have some of your money in an investment that is easily converted to cash in case of emergencies. The old adage "don't put all your eggs in one basket" is excellent investment advice. Prepare an annual balance sheet (a list of all your assets minus all your debts) to determine your net worth. A comparison of your annual balance sheets will show you whether you're meeting your financial goals. Plan where you want to be financially by retirement age. Over 90% of Americans must rely on the government or others for assistance during retirement. With proper planning and diligence, you can be among those who can retire in comfort. Click here to calculate how much you need to save for retirement. Update your plan regularly. Review your financial plan often and adjust investment choices when necessary to keep your plan on track with your financial goals. Don't use credit to purchase consumption items. Wait until you can pay cash for things which decrease in value. Borrowing money to purchase a home is usually a sound idea. Using credit to purchase household furnishings is not. Pay off your credit card balance every month. Your credit card should be used for convenience, not as a source of long-term financing. Credit card interest rates are much too high. Monitor your investments to maximize your after-tax return. The difference that a 2% greater return can make in the growth of your investments is dramatic. Click here to calculate the monthly yield required to reach your savings goal. Have your insurance agent do at least an annual review of your insurance needs to determine that you are neither under- nor over-insured. Be sure to contact your agent when you buy or sell any property. For assistance in your financial planning, contact us.